The low-FODMAP diet is a scientifically proven dietary approach that reduces certain carbohydrate-rich foods which can over-fuel gut bacteria. 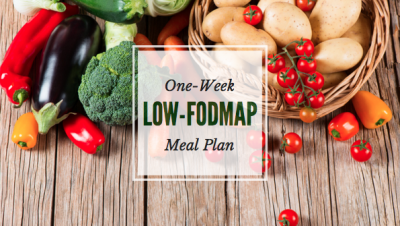 Whether your dietitian has recommended low-FODMAP foods, or you simply want to try a structured elimination diet to pinpoint what's giving you digestive trouble, this easy-to-follow 7 day meal plan and grocery list will take the guesswork out of low-FODMAP eating. FODMAPs are short chain carbohydrates that are poorly absorbed in the small intestine. The term FODMAP is an acronym, derived from "Fermentable, Oligo-, Di-, Mono-saccharides And Polyols”. The FODMAP diet is often recommended as a way torelieve chronic digestive complaints such as bloating, abdominal pain, gas, excessive burping, diarrhea and constipation. These symptoms are common in people with Irritable Bowel Syndrome (IBS), but lots of people without a formal diagnosis also struggle with them. Although it doesn’t help everyone, the FODMAP diet is actually a real breakthrough, bringing dramatic relief to many who have suffered for years from seemingly untreatable digestive issues.